Well, our week here in Jacksonville is all but at an end, alas. It has been quite the busy week for us here. Initially, we were planning on taking things easy. We were going to take our foot off the gas pedal a bit and just allow ourselves some time to unwind. Although we did enjoy some really great quality time with some fabulous friends, we’ve been on the go pretty much non-stop all week. We’re certainly not complaining. We’ve really had a lot of fun exploring our old stomping grounds, catching up with some truly amazing people along the way. I’m going to try to sum up the entire week in a single shot. There are literally dozens of people we could spend endless weeks visiting here in Jacksonville. There are a select few, however, that we consider really very special friends. We went out of our way to make sure we saw all of those this week. First up was Scott and Trina. Scott was my manager for several years at CSX Technology. It would be a gross understatement to say I learned a lot from Scott. I can honestly say he was one of the best managers I’ve ever had. I actually think of him more as a leader than a manager. There’s a tenacious drive and enthusiasm about him that’s hard to explain but readily evident if you spend any time with him. It doesn’t matter what his interest is at any given moment, he always puts his all into it. It’s infectious in a good way. Although we were uncertain about our movements or who we would visit from day to day, we had planned well in advance to spend the Saturday with Scott and Trina specifically. Neither Scott nor Trina have changed a bit. Nor, for that matter, had Kristen, their daughter. Kristen actually visited us in England when we lived there following our world tour. She spent some time with my brother John and Lisa when we were living with them temporarily. Kristen has three lovely kids of her own now. We got to see them as well as Kristen’s husband, Adam. Not content to simply invite us into their truly beautiful home, I was privileged enough to be put in charge of the grill for the BBQ lunch they laid on for us all. I’m pleased to say it has been almost a week since and no complaints have yet reached me about any food poisoning as a result of my questionable grilling skills. Satya, who also worked for Scott for a while at CSX, came along with us to the reunion with Scott and Trina. As it happens, Satya and Scott hadn’t seen each other for quite some time also, so it was a really good three-way catch-up. After a truly lovely afternoon, we all bid a fond farewell to Scott and Trina before setting off back through their leafy gated community suburb. However, since Sandy left her bag behind, we were back again after about two minutes before another round of good-byes. Alas, we also left one of the kids’ iPad chargers behind as well, although that didn’t become evident until later on in the day once we were quite some distance from their house. We’ll swing by at some point and collect it again. 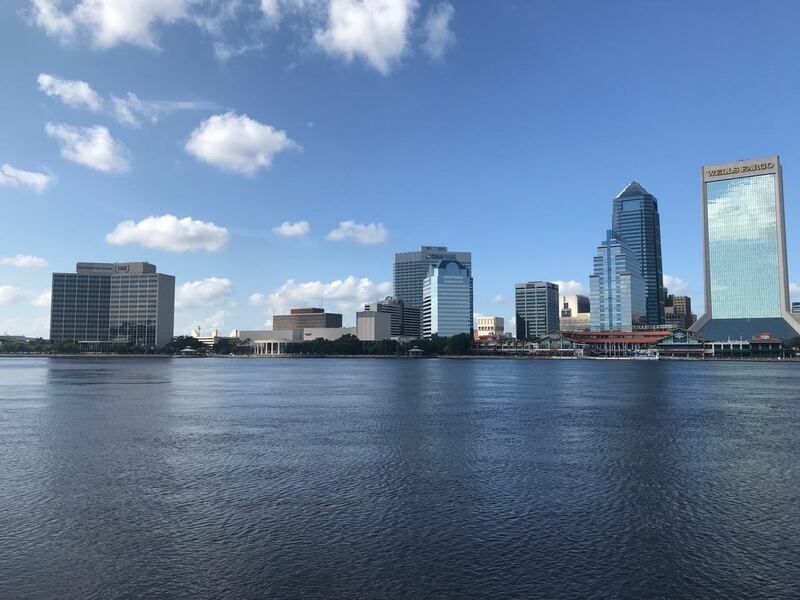 Driving around our corner of Jacksonville, we slowly re-familiarized ourselves with the area. All the landmarks, roads, shopping centers, etc., brought everything flooding back again. After leaving Scott and Trina, we found ‘our’ Chili’s and had dinner. It was a lovely ending to a lovely first full day here on the first coast. One of our very favourite pastimes here in Jacksonville, if not anywhere on the entire planet, is wandering the beach for fossilised shark’s teeth. There’s a particular public beach here in Jacksonville where this is done. It’s called Mickler’s Landing. It’s about a twenty-minute drive from where we’re currently staying. When we lived here, Sandy and I would visit there often. We’d walk the beachline for a couple of hours on a weekend. In our second day here, we arranged to meet Kristy at Mickler’s Landing. Kristy and Carlos lived three doors down from us. We consider them to be probably our best friends here in Jacksonville. Carlos is a Paediatrician – a good one. We’ve kept in touch with Kristy and Carlos ever since we left Florida. When we lived here, Carlos and Kristy had three boys all living at home. They would have been around 8-12 years old or thereabouts between them. One of the things we really liked about our neighbourhood was that it was very family-friendly. I often played with the boys, as well as the other kids in the street. Back then, I was still not really a true grown-up yet – not mentally at least. The boys often referred to me as ‘the big kid’. Carlos and Kristy are the sort of friends you always wish to have. We can be ourselves around them. Nothing is ever too much of a bother. Carlos had previously given us his home, work, mobile and on-call numbers and told me to contact him anytime if ever there was anything we needed. Once or twice we’ve availed ourselves of this offer, but we’ve only ever done so when we felt it was really needed. When Joey was born, it was a complicated birth. The effect it had on me both physically and emotionally really took its toll. Dr. Carlos was the one person I was able to turn to for emotional support at the time. I remember it vividly. When I called, Kristy picked up the phone. She was glad to hear my voice and started with her usual cheerful chit-chat. With a tremor in my voice, I asked if I could please speak to ‘doctor’ Carlos, with a slight emphasis on the word doctor. That was enough to convey the fact this was something more than a usual catch-up conversation. Kristy immediately handed the phone to Carlos. I poured my heart out explaining about the difficult birth, the situation with Sandy being taken to theatre for the delivery and how I struggled with it all. I was a complete emotional wreck at the time and in tears. Dr. Carlos was brilliant. He patiently took me through it all and explained what I had witnessed. He answered all my questions, helped me put it all into perspective and gave me the strength I needed. He was there for me when I most needed it. Indeed, Kristy and Carlos have ‘been there for us’ on numerous occasions over the years. It’s not by accident that we’ve seen more of them on this brief one-week whistle stop tour than we have anyone else. Although Dr. Carlos was at work when we found our way to Mickler’s Landing beach, Kristy was already there and set up with a parasol and chairs. So was Alex, one of her sons, and his beautiful girlfriend. Alex has turned into a fantastic young man. He was just brilliant with Joey, making him feel comfortable. In the event, that was partly due to wearing a MacDonald’s happy meal box on his head, but that’s another story for another day. We spent the better part of a couple of hours on the beach, catching up and, of course, finding shark’s teeth along the shoreline. I even took a dip in the sea, having fun splashing against the incoming waves up to my neck. I can honestly say that these two hours were the best two hours of my entire time here in Florida. The weather was good, the company was excellent, and I just fell into the strangely soothing process of strolling along the beach with my eyes down trying to spot the tell-tale triangular shaped shiny black fossilised teeth. On a good visit, Sandy and I might find anywhere from five to fifteen shark’s teeth each. We’d have fun trying to outcompete each other each time we visited. Who would find the first, the largest, the most interesting, etc. We have a special jar full of all the teeth we’ve ever found. On this visit to Mickler’s Landing, I found around twenty, so a really good haul. Realistically, we were never going to last much more than a couple of hours on the beach before the kids overheated. To be honest, I was surprised they lasted as long as they did. I put that mostly down to just how well Alex helped to manage Joey. He really is very good with kids. Kristy, Alex and his girlfriend joined us for a spot of lunch at the nearby MacDonald’s, which we all thoroughly appreciated. We then went home to freshen up. As luck would have it, Kristy and Carlos were free for dinner tonight, so we met them at their house early in the evening. On our way to their house, we couldn’t resist a quick drive around the neighbourhood to see our own house as well as those of the various people we know and love that lived there when we did. While catching up at Kristy and Carlos’ place, we contemplated where might be a good choice for dinner. I mentioned that Sandy was partial to a nice prime rib. Then it dawned on me. There’s a really nice restaurant that we both love, called Clark’s Fish Camp. 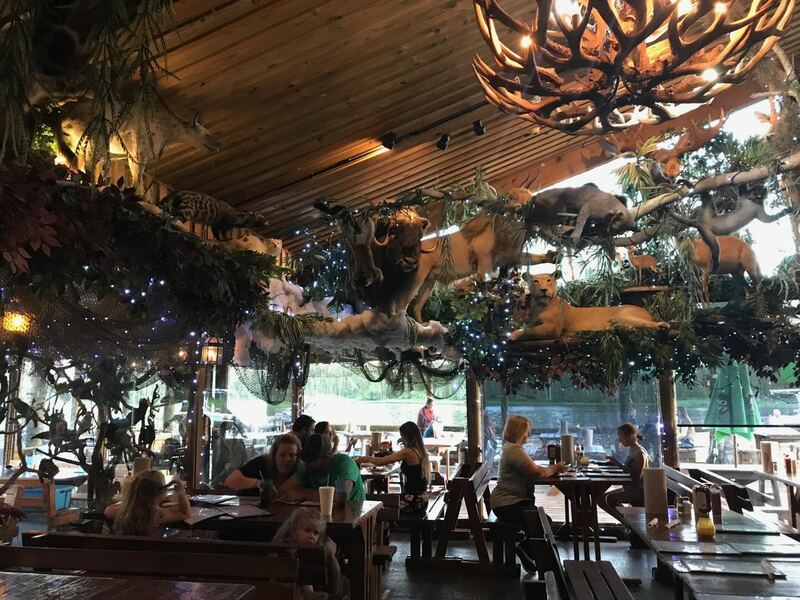 It has a bewildering array of stuffed animals that decorate the various sections of the restaurant. Just about every animal you can think of is represented there somewhere. Once the suggestion was out there, everyone thought it a great idea. We were in luck in that it was a Sunday, but the restaurant wouldn’t close until 9pm, giving us ample time to get out there and really enjoy a lovely meal. The kids absolutely loved Clark’s. It nestles right on the river. 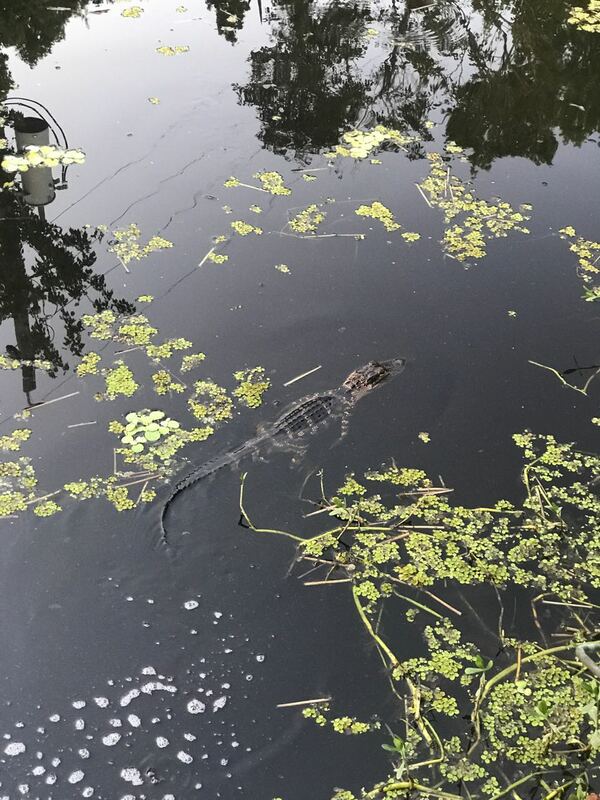 Always a favourite are the baby alligators that scavenge around the restaurant’s boardwalk. There were two very small baby alligators there tonight, floating around practically within arm’s reach. Even though we were handed menus, I already knew what I was going to order. I knew this pretty much as soon as the thought of going to Clark’s entered my brain. It’s a menu item called Jack’s Cut. It’s a slow-roasted rib-eye that’s about as big as any you’ll ever encounter anywhere on the planet. It’s 2.25 Lbs (about 1Kg) of slow-cooked, mouth-watering, prime rib. The thing is enormous – they bring it out on a special oval plate because it just doesn’t fit on the regular ones. It’s really hard to get through it all in a single sitting, although I gave it a seriously good crack. Carlos and Kristy are into geo-caching. They introduced us to this fun hobby. After the meal, we all spent about half an hour trying to track down a hidden cache right at the restaurant’s main gate. We did find it in the end and duly logged the finding in the smartphone app. After a slow start the next day, I drove towards downtown to a BBQ restaurant called Sonny’s. I met Joe and Christopher there, two colleagues that I worked with at CSX Technology. We had a fantastic time catching up and exchanging anecdotes about raising children. I didn’t get the chance on this trip to go in to the CSX building as I have done on previous visits. That being said, there really wasn’t anyone there I could have seen that would remember me. With the steady turnover of staff through the company over the years, there’s just a small handful left that would know me. Joe and Christopher were two. Another couple were unavailable this week as they were out of town. There are still plenty of people around town that would know me from my CSX days, but they have all since moved on to other things and I’ve not kept in touch with them. One of them, however, was Gary. I will try to track him down a bit later this week. He isn’t so quick to get to his Facebook messages. While I was strolling down memory lane with Joe and Christopher, Sandy had taken Jennifer to spend some time with one of Sandy’s very best friends in the whole world, also called Jennifer. It’s the same Jennifer that went on the cruise with us a few weeks ago. This left me with a couple of hours to kill, so I called Kristy to see what she was up to. As luck would have it, she had nothing better to do so she agreed to come with Joey and me to Jax Beach for a bit. I collected Kristy from her house, and we drove over to Jax Beach. We paid the $1 per person fee and went for a stroll down the pier. I’m pleased to see the pier has been re-built following the near total destruction it suffered at the hands of hurricane Floyd in 1999. Even with the lovely sea breeze, we couldn’t remain out exposed to the sun for too long, so we wandered in to a couple of nearby tourist souvenir shops for a bit of a peruse. Having dropped Kristy back home, Joey and I collected the girls and went back to the house. This evening, another very good friend of ours, AnnMarie, came to visit us with her partner, Bill, and one of her daughters, Ashley. We were also treated to a video conference with Kavitha, another one of AnnMarie’s daughters. Both girls have developed into lovely young women. All of us present had a truly marvellous meal at a nearby Hibachi restaurant. This was a first for Joey and Jennifer, who just loved all the tricks the chef did for us right at the table. We slept well following the plentiful Hibachi meal. The following day, we had nothing planned for the morning. Not wanting to waste that time, we arranged an impromptu trip to downtown for a couple of hours at MOSH, the Museum Of Science and History. 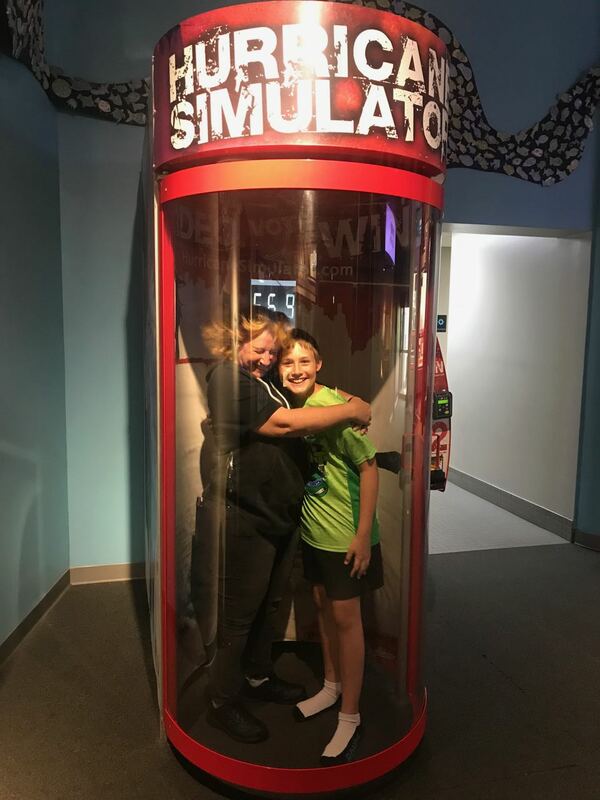 It has a hall filled with interactive exhibits, which the kids really enjoyed – not to mention the also popular hurricane simulation pod. Our tickets granted us access to a science show as well as a planetarium session. There were just three other guests with us four at the science show, but we still had a great time. The presenter was very good and the kids both got to help out as volunteers a couple of times. When we lived here, the planetarium was one of the old-style ones that sort of looks like a darlek’s weapon arm. Nowadays, there’s a state of the art single-lens projection system that provides a lot more capability. Like the science show, the planetarium session was scarcely attended, but we really enjoyed the forty-five-minute show nevertheless. Following MOSH, we once again graced the home of Carlos and Kristy. Indeed, we also all went out to dinner again. This time it was Chili’s. Once again, we spent some time finding a geo cache and logging the find. I can see this new hobby getting quite addictive over time. The following morning, we stopped in at the local MacDonald’s for breakfast (the place is not run very well at all) before driving over to Mayport Naval Base to visit our dear friend, Patti. There was a rather lengthy security check process at the base with various forms that needed to be filled out. This meant we had precious little time to spend with Patti before she had to go to work. 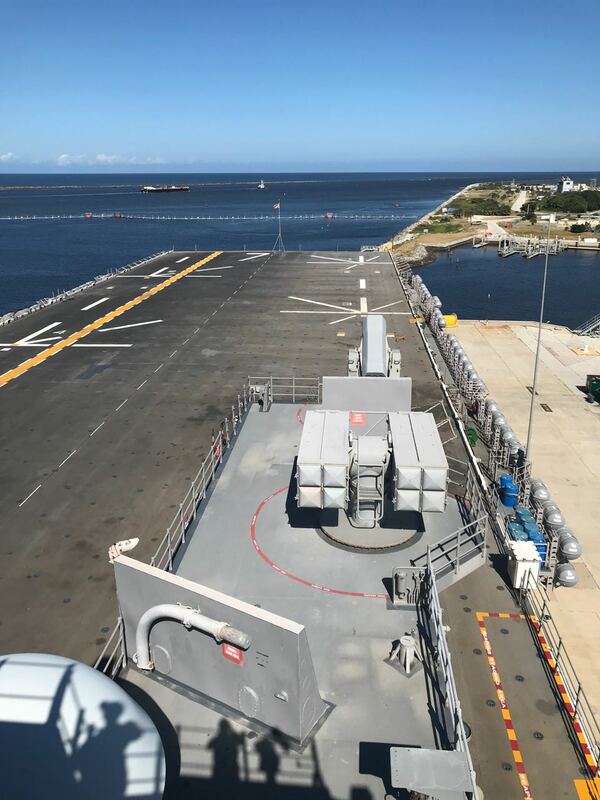 Rather than allow our time on the base to go to waste, Patti arranged for one of her friend’s husband, Kyle, to give us an all-access visit to the USS Iwo Jima, a helicopter aircraft carrier that’s based out of Mayport. 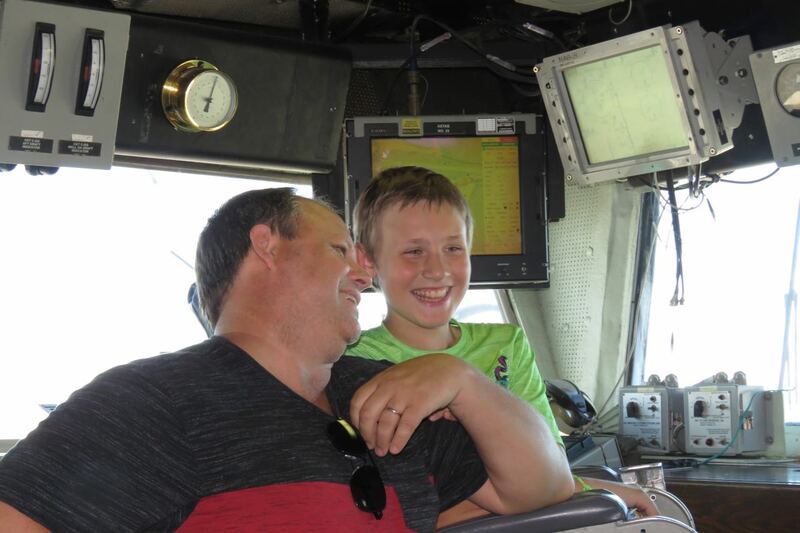 Kyle gave us an absolutely wonderful tour of the ship – including the bridge. As his speciality was weapons operator, we also got to see many of the weapons systems up close and in person. Kyle took us up onto the flight deck and to various other locations on the ship, doing a terrific job of providing heaps of information. After leaving the navy base at Mayport, we stopped at a nearby Chick-Fil-A fast food restaurant to top up with a bit of sustenance. We then met up with AnnMarie at her place of work. She had bought the kids a birthday present and was keen to give it to them in person. Since the week was progressing fast, I emptied the car in preparation for the packing that still needed to be done. We needed to make sure we had everything inside the house, so as to ensure that we had everything that needed packing ready at hand. I emptied the car completely – to the point that I was able to collapse all the seats in the cabin completely into the floor. This resolved once and for all the question of whether that missing GoPro might have fallen into some crevice somewhere. It hadn’t. On Thursday, the day before our departure, we ended up doing much more than we had expected. I originally thought this would be the day that we took our time to pack everything ready for our Friday departure. Instead, it turned out to be one of our busier days with quite a few miles covered in the minivan. Thursday started with Sandy taking Jennifer to get her hair cut. I finally managed to get hold of Gary, another one of my ex CSX work colleagues. We agreed to meet up for lunch at a please called Zaxby’s. Joey stayed at home by himself for the duration, which he was more than happy with. Left to his own devices, he would never leave his room. Gary and I had a great time catching up. Like many people we’ve met this week, there’s half a chance we might meet up next in Europe sometime. I let Joey know I was coming back for him and he, of course, wanted me to bring him some food in. On the way, I called Sandy. The original plan for today was to spend some time with our good friend Jennifer and her daughter Sandi and family. Unfortunately, some logistical problems they were having with child seats in the car meant there would be a delay in getting together. Instead of taking food home for Joey, I collected him (much to his disdain) and we went through the MacDonald’s drive through instead. Annoyingly, they didn’t have everything Joey wanted – seriously, which bloody MacDonald’s runs out of things? Did I already say this place wasn’t run very well? Anyway, Joey and I went to collect Sandy and our Jennifer. Since we were roughly in the general vicinity, we decided to fill a bit of time by driving around to all the places we had previously lived to snap a few photos. At a couple of these stops, we did knock on the door or speak to people that were present to let them know why there were strangers snapping photos. Some of those from the last place we lived actually remembered us, so we lingered for a bit of a catch-up chat. As it happened, Kristy wasn’t far from our location. She was in fact at a nearby Target trying to find a little something each for the kids as a birthday gift. We decided to join her for a bit. Our friend Jennifer caught up with us while we were there. 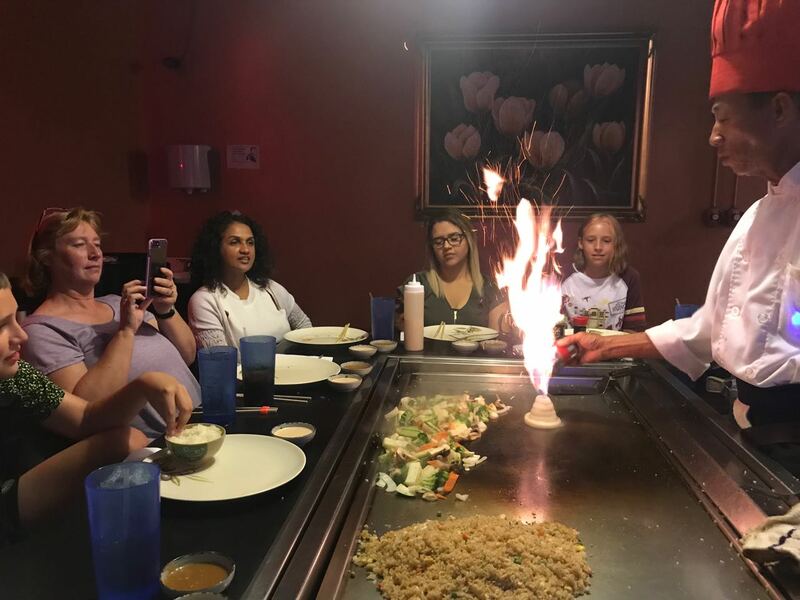 After bidding a fond farewell to Kristy (I think this was the fourth now), our Friend Jennifer and the rest of us made our way to a nearby Japanese Hibachi restaurant, where Jennifer’s daughter, Sandi, and her family joined us for dinner. The Hibachi meal was another success. After waddling out of the restaurant satiated, we all piled into our cars and drove over to Sandi’s new house, where we spent the rest of the evening enjoying their company. It’s so great to see so many of the kids we saw growing up turn into fine young adults. It’s now gone midnight and Sandy is still downstairs doing last-minute packing. I have serious doubts we’ll be within our weight limits, but Sandy seems confident. At this point I can only hope. On this trip, we went almost exclusively with cash, choosing to use the plastic on only a very limited basis. From the get-go, I have been tracking our spend, making sure we didn’t burn through all the cash too quickly so as to run out, but also making sure we didn’t scrimp and scrape to the point the holiday would be adversely impacted. I’m pleased to say all my hard work has paid off. On this our very last day, we are down to around $100. We will spend about half that filling up the car with petrol tomorrow before dropping it off at Jacksonville airport. The rest will pay for breakfast and perhaps some snacks at the airport. Fortunately, we’ve been spoilt rotten while here in Jacksonville with various people insisting on paying for meals and things on occasion. Naturally, we’ve insisted on paying as often as we can, but have only been able to do so on those occasions where I was firmly insistent. This past week has been strangely therapeutic. Both Sandy and I have pined for the days that we used to live here. A week was a bit too brief for my liking. I would have liked to spend just a little more time with people and I would definitely have loved to spend more time at the beach, combing for shark’s teeth. We didn’t get to see the alligator farm, St. Augustine and all it has to offer, Kennedy Space Centre and a heap of other things. The good thing about moving back to Europe, however, is that Florida is no longer an inaccessible place for us. We will return here, I feel absolutely certain of that fact.